Kwik Kopy, at the intersection of Hwy 3 and Cty 1 across from Applebee’s, will close for good this Friday, May 21. I spoke with co-owner Monica Mead yesterday who said that the recession and industry changes were the twin culprits. 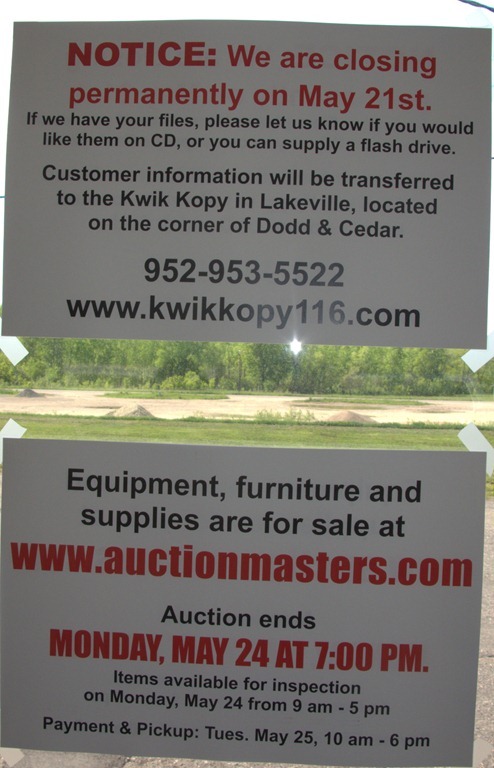 Customer info is being transferred to the Kwik Kopy in Lakeville, near the corner of Dodd and Cedar. Customers can get their digital files via CD or flash drive this week from Monica. Auction Masters is handling the online auction of equipment. It ends 7 pm Monday. This is very bad news. They did such good work. I wish we knew about pending closings before it happens. Nothing in NNews? Stephanie- You raise an interesting question about businesses which are in the throws of failure. How much of this information should be divulged publicly? I’m sure this was a wrenching decision for the owners, but if they would have shared their struggles 6 months ago, would they have been in business until now? Would that announcement have scared customers away or created “sympathy” business? Sorry to see them go. Best of luck to everyone on getting jobs. Arrghh, another closing. Sorry to see it happen.